The Clean Coalition conducts Solar Siting Surveys to help utilities, Community Choice Energy agencies (CCEs), cities, and communities assess the technical potential for local solar generation on built environments such as rooftops, parking lots, and parking garages. 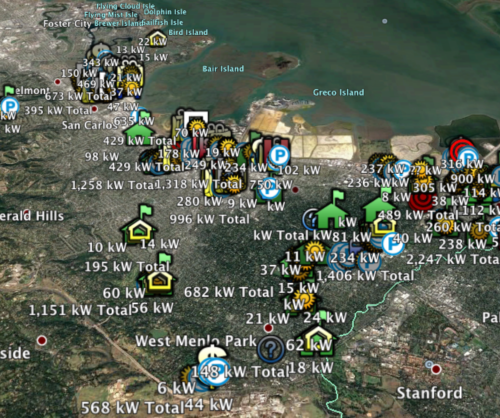 Our methodology evaluates prospective sites, as well as the interconnection hosting capacity for each site — which is vital to understanding whether a solar project can be interconnected to the grid in a cost-effective manner, and is a critical determinant in assessing the overall cost-effectiveness of a solar project. 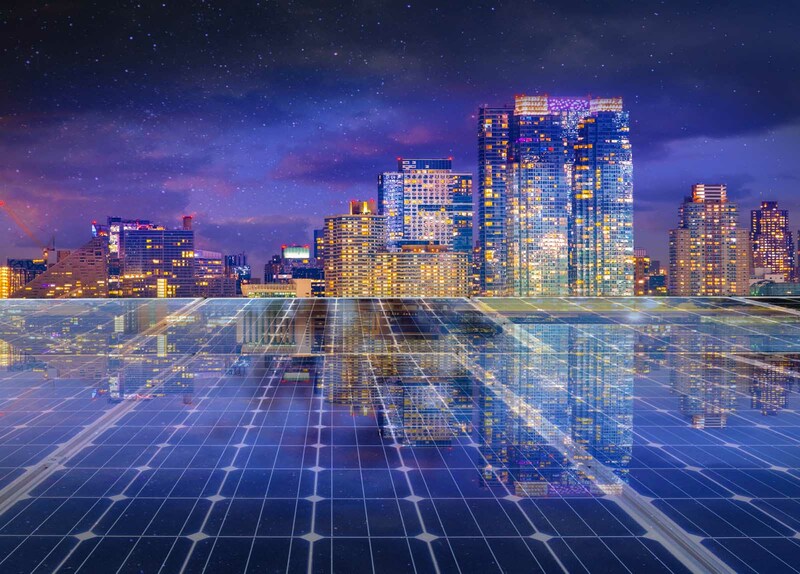 We focus on wholesale distributed generation (WDG) systems, often commercial-scale solar projects, that connect to the distribution grid and sell the electricity they produce to the local utility to serve local energy demand. The Clean Coalition completed a Solar Siting Survey for the San Diego SEIN Initiative, which is exploring new ways solar energy can improve the affordability, reliability, and resilience of the nation’s electric grid. 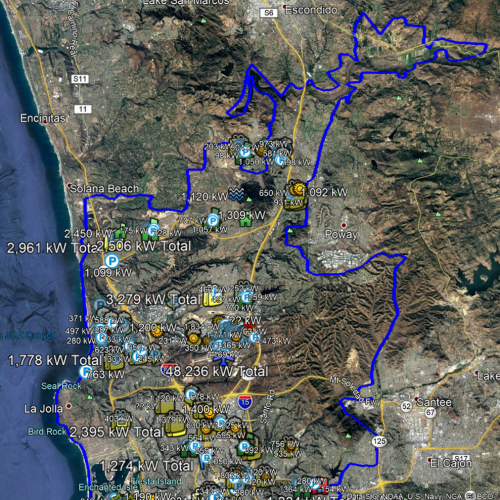 Our San Diego Solar Siting Survey identified approximately 500 megawatts (MWac) of technical solar siting potential on over 120 discrete sites — enough to fulfill the average power needs of about 500,000 homes during peak solar production hours. Each site identified has the potential to host at least 1 MWac on rooftops, parking lots, and parking structures located at the site. The Clean Coalition completed a Solar Siting Survey for East Bay Community Energy’s (EBCE) Local Business Development Plan, which developed a comprehensive framework for accelerating the development of clean energy assets within Alameda County in California. Our EBCE Solar Siting Survey identified over 650 MW of technical solar siting potential on over 250 discrete sites — enough to power 165,000 homes. 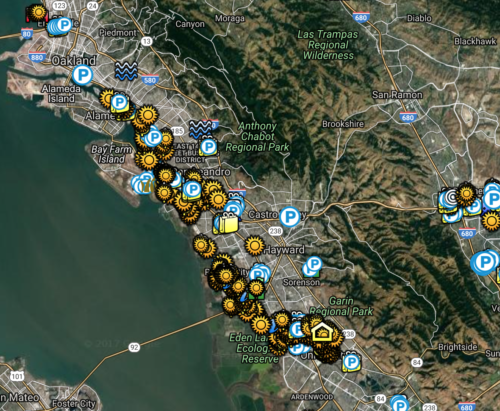 Each site identified has the potential to host at least 1 MW on rooftops, parking lots, and parking structures located at the site. As part of the Peninsula Advanced Energy Community (PAEC), an initiative designed to streamline policies and showcase projects that facilitate local renewables and other advanced energy solutions, the Clean Coalition conducted a Solar Siting Survey to assess the potential for commercial-scale solar in southern San Mateo County, California. Assessing built environments in the area to determine which are best suited for a solar PV installation of at least 100 kilowatts (kW), this Solar Siting Survey identified over 65 MW of technical potential for commercial-scale solar installations within the PAEC region. 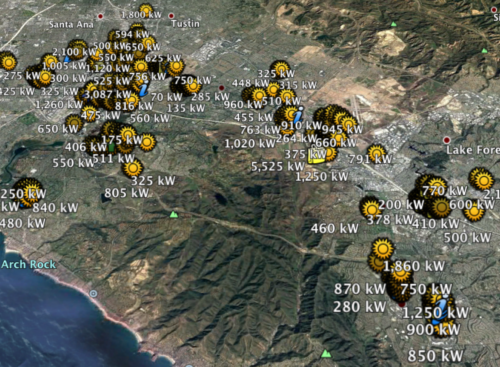 The PRP Solar Siting Survey highlights significant levels of local solar PV energy that can be generated within an area in southern and central Orange County, California. 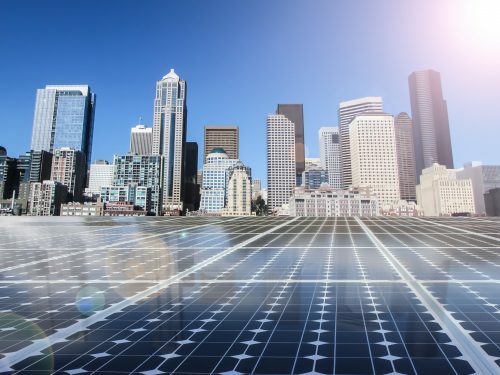 The grid area assessed by the survey comprises the Preferred Resources Pilot (PRP), an effort by Southern California Edison (SCE) to study and demonstrate how distributed energy resources, including local solar, may support local reliability needs. The PRP Solar Siting Survey identified over 160 MW of technical potential for large commercial-scale solar installations 500 kW and larger within the PRP grid area.